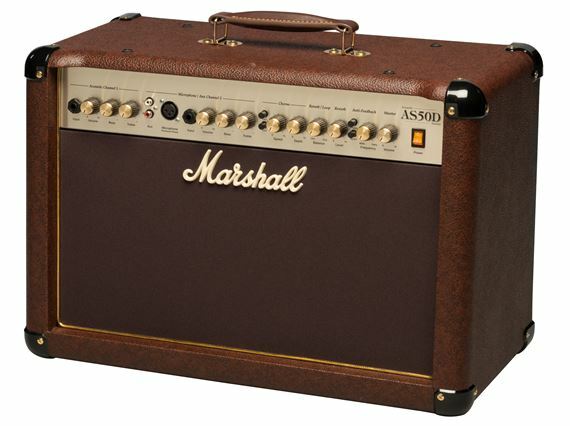 Shop Marshall AS50D Acoustic Guitar Amplifier from AMS with 0% Interest Payment Plans and Free Shipping. 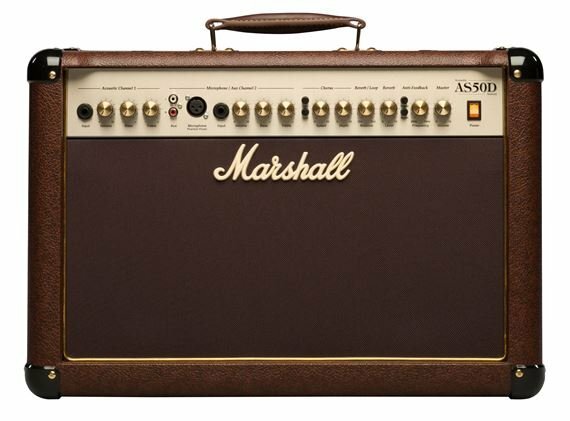 The Marshall AS50D is incredibly expressive and feature-loaded with sound quality that will impress all. If you thought that Marshall caters only to metal heads and rockers, this new amp will change all that. The AS50D features two 8-inch woofers to provide plenty of volume and round bodied tone when needed. Its newly-designed polydome tweeter brings crystal clear presence to any performance. 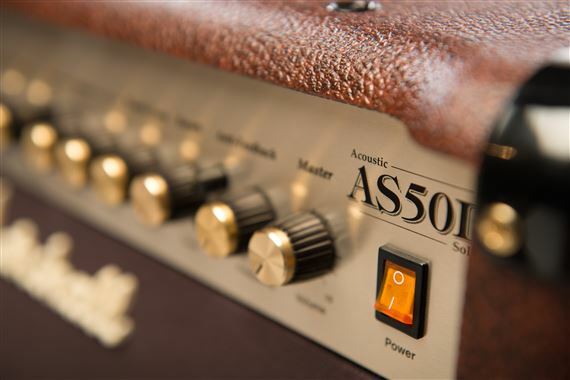 The AS50D provides a phantom-powered XLR microphone input for use with condenser microphones, as well as stereo RCA phono inputs for connecting MP3 players, drum machines and many any other line level electronic devices. It comes standard with an anti-feedback notch filter, channel assignable chorus, digital reverb, effects loop and D.I. output. Just what I need for fingerstyle. It sounds wonderful, doesn't quack. It's light. I'm getting a 10 band eq, a compressor and a bodyrez to put in front of the eq. I'm getting a small mixer. It's kind of mid heavy on the vocals, I'm using an sm58. Carry this light amp a mixer and a pedal board works for me. Thank you AMS! I've had varios amps in the past but this is by far the best I have owned. The looks are wow, sound is woww, the effects are freakin wowww! Thank you again AMS for making awesome gear available to own! You guys are the star here! I needed an acoustic guitar amplifier and had never owned 1. So I called American musical supply and got pointed in the right direction. I liked this so much I ordered a second one to use as a stereo rig. The tones are true to the instrument and the reverb and chorus are very musical and useful. I am also very pleased by the build quality...this thing sounds and looks killer. I can't imagine anyone not being happy with purchasing this. I have nothing but great things to say about this amp! Perfect for the solo acoustic artist. I've been a solo acoustic gigging musician for years and this is the best amp I've played through. You get a nice rich sound from your guitar and I love the reverb effects on both the vox and guitar. The chorus is a nice touch, though I don't use it much. I've played Marshall amps almost exclusively so I knew they'd handle my guitar well, but I was really surprised with the vocal sound. A very warm tone with minimal knobs for a quick set up. It sounds great mic'd or you can run a line out to a PA for further EQ if you'd like. It's light enough and compact enough to throw in your car for a last minute gig. Great for small to medium rooms, mic it or line out for a larger one and get rocking. You won't be disappointed. "Fantastic Acoustic Amplifier with Vocal Channel Built In"
Marshall Amplifiers have always been #1 in my opinion. 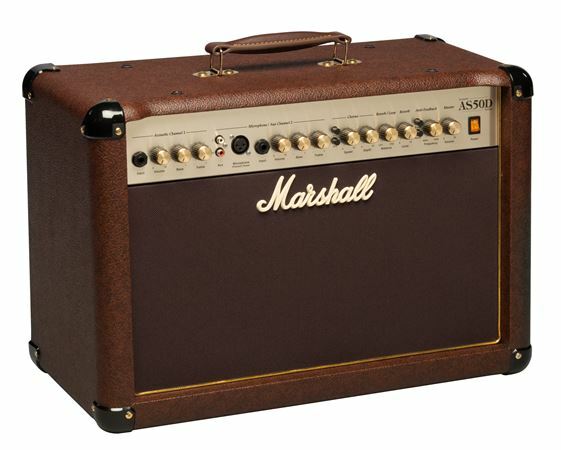 just think about how many people say "it sounds just like a Marshall". There you have it. 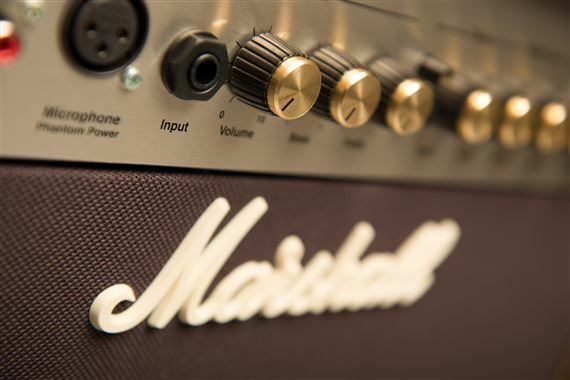 Marshall is and always has been the benchmark by which all other rock-n-roll amps are judges. Overall the quality is ok, but a little disappointed that is is made in China. The black protective corners are plasic! Whats up with that? 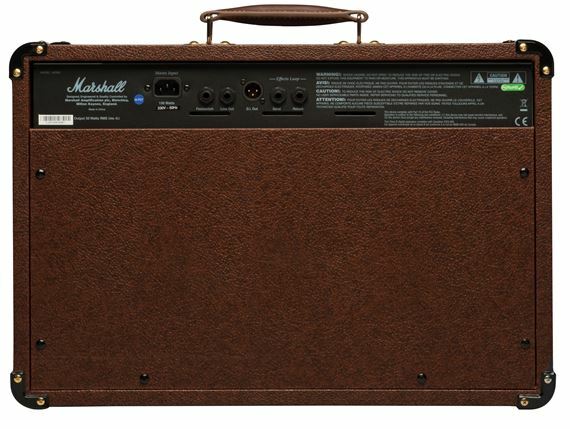 All my other amps have metal corners...come on Marshall for $400 you can afford metal corners! Have only had it a few days, so no comment yet. The brown cover is a nice touch and very nice carry handle. Plasic corners are cheesy and expect they will break at first impact. Everything you expect from a Marshall. Built like a tank and not to heavy. Great 50 watt amp with two channels and reverb. I play my Martin Guitar and sing thru a AT2035 and the sound is great for my home studio work. 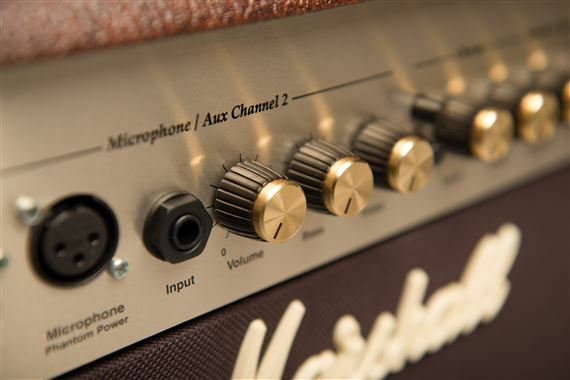 Amp has Phantom power, xlr outputs, and antifeedback loops. Its a high quality Amp for the money. Great solid state sound. Best of the Best!! AMP has easy users manual.